Late last month, U.S. Soccer proposed changes to its Division I standards for professional soccer leagues. Among other things, these proposals will require any D1 league to have at least 16 teams (up from the current requirement of 12), and that 75% of those teams be based in cities with more than 2 million people (up from more than 1 million). On its face, the proposals seem rather innocuous and filled with common sense: “D1” connotes a “major league” status that would be tough to justify if a league were comprised primarily with teams from Bethlehem (75,000), Fall River (89,000), Pawtucket (71,000), and New Bedford (95,000)—notwithstanding the obvious historical charm of such a circuit. It should come as no surprise to anyone with some knowledge of US soccer history that there is nothing new under the sun when it comes to disputes between leagues and the governing body of American soccer (for example, click here for a look at the American Soccer War of 1928-29) . The anti-trust saber has been rattled before between competing soccer leagues, and we are going to revisit those halcyon days now. In light of other recent news, one would be excused for thinking “anti-trust” is what happens after you find out your spouse registered on the Ashley Madison website. In fact, it is a term of art referencing seminal legislation passed at the turn of the last century. Anti-trust law refers to a body of federal law designed to regulate the business practices of corporations, with the primary aim to promote fair competition and to benefit consumers. Price fixing and buying up all of one’s competition are two obvious examples of conduct that violates anti-trust law. Sports leagues have always been sensitive to anti-trust issues. At their essence, they represent a monopoly on professional sports which, in an of itself, is fine—provided the existing leagues don’t get greedy by taking steps to eliminate even the possibility of a rival league. Baseball, because of a widely-criticized Supreme Court decision from the 1920s—enjoys an anti-trust exemption. All of the other professional sports leagues, however, must be mindful of the rules. Why? Well, among other things, violation of anti-trust laws can result in treble damages against the perpetrators. In America, professional soccer is particularly susceptible to anti-trust challenges, and this has been the case for some time. In baseball, basketball, football and hockey, the professional leagues largely govern themselves—and any rival league willing to enter the marketplace is free to do so. Obtaining manpower is also relatively simple: outbid the existing teams for out-of-contract players, and you have a team. Soccer in America is a bit different. Unlike in the other sports, where you can just start a league and hope for the best, in soccer any professional league is required to get a “license” in the form of sanctioning by U.S. Soccer, whose authority, in turn, derives from FIFA. Failure to obtain this sanctioning will result in the start-up being branded an “outlaw league.” Teams in such a league will be barred from FIFA-sanctioned competitions, and anyone playing in such a league will be suspended from FIFA-sanctioned events like the World Cup. In the mid-1960s, professional sports were booming in America. Major league baseball expanded (largely to head off the challenge of a third major league), and rival leagues popped up in football and basketball. Against this backdrop, a number of businessmen decided they want to glom on to the next big thing: professional soccer. Thus, it was in 1966 that not one…not two…but three professional soccer leagues arrived on the scene: the National Professional Soccer League (NPSL), Bill Cox of the International Soccer League (ISL) and Robert Hermann (for whom college soccer’s Hermann Trophy is named); a second group, the National Soccer League (NSL), headed by Richard Millen; and the North American Soccer League, headed by Jack Kent Cooke. All three groups knew that they needed sanctioning from the United States Soccer Football Association (USSFA, as US Soccer was known until 1974), FIFA’s American representative. For its part, the USSFA tried to take a common sense approach, advising all three groups to merge to form one league. When this was rejected, FIFA President Sir Stanley Rous advised the USSFA that it should not sanction any one league, but individual clubs based on their respective merits. The USSFA, in turn, rejected Sir Stanley’s suggestion. 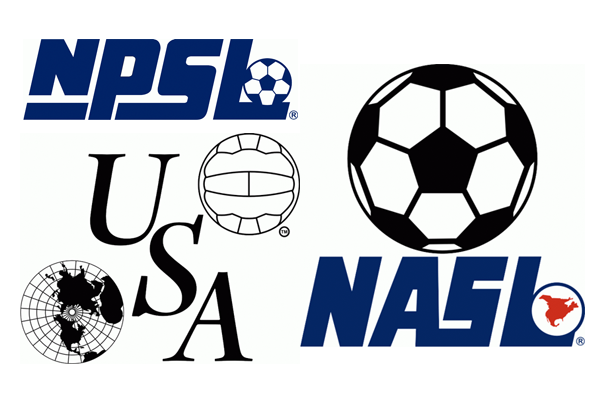 Ultimately, the USSFA opted to sanction the NASL–in no small part because it was the only circuit willing to pay tribute to the USSFA in the form of $25,000 franchise fees, 10% of television and 4% of ticket sales. The other two groups now did what was previously considered impossible–they merged–and the NPSL announced it would begin play in 1967 without FIFA sanction. As a result, it would operate as an “outlaw” league. This was no mere label. For instance, the English FA sent letters to all of its clubs warning that players who went to the NPSL could face “permanent suspension.” Also, rather amusingly, a number of NPSL owners complained that the status would not allow their teams to play in the World Cup. It did mean, however, that foreign teams like Pele’s Santos would not be permitted to play friendlies against NPSL sides, depriving the renegade circuit of still another form of revenue. Despite all of this, the NPSL did manage to score the golden ticket of American sports: a network television contract. While the “10 year” deal with CBS was largely illusory, it did give the outlaw league a measure of credibility in the eyes of the American public. As a result, the NASL–which did not plan to begin play until 1968–felt compelled to move up its timetable by a year, importing established teams like Wolverhampton Wanderers and Stoke City to represent NASL cities…one perk of being a sanctioned league. Also, for less obvious reasons, the league rechristened itself the United Soccer Association. While some NPSL owners may not have known the World Cup was not a club championship, they did know a little about the law. From the start, the group made it clear that it would not take being denied a “license” lying down. “We didn’t feel that any organization had the right to give an exclusive franchise to any one soccer league,” said the NPSL’s Vice President. Throughout 1967 the two leagues competed against one another, but also discussed a possible merger. Attendances in both leagues were far less than had been envisioned, and both parties realized that the situation was far from optimal. However, no deal was reached and, just before the second leg of the NPSL championship between Oakland and Baltimore on September 9, 1967, the league filed an $18 million antitrust lawsuit in federal court against FIFA, the USSFA, and the USA (the league, not the country). Even the lowly Canadian Soccer Association was included, because of Canadian teams playing in both leagues. The suit alleged that “in violation of Federal antitrust laws, the defendants have entered a conspiracy to drive the [NPSL] out of soccer,” by, among other things, “ma[king] a contract giving the [USA] exclusive control for 10 years over who may operate pro soccer teams in the United States.” The lawsuit sought treble damages and an injunction prohibiting the USA from operating until such time as the NPSL and its members were granted recognition. Not surprisingly, given the amount of damages at stake and the fact that both leagues were losing money by the truckload, the lawsuit resulted in what was previously unachievable: a merger. On December 7, 1967, the merger was announced, and the new league christened the North American Soccer League. As a result, the significant question of whether U.S. antitrust laws would trump USSFA/FIFA authority was left unanswered–even though, on its face, the “sanctioning” process would appear to scream “anti-competitive practice.” More to the point, since the case settled so early in the process, the exact defenses FIFA and USSFA were prepared to offer were never revealed. As the question remains unresolved, the spectre of anti-trust suits continues to hang over US Soccer and, by extension, FIFA. In 1969, for instance, after the collapse of the NASL into a 5-team circuit, one of the league’s most powerful and successful teams, Oakland Clippers, opted to run a slate of international friendlies. Needing the omnipotent FIFA-sanction, the most powerful U.S. team of the era joined the California Soccer Football Association, itself a sanctioned league. Not surprisingly, the move was not welcomed by either the NASL or USSFA, who viewed the Clippers as not only abandoning the pro league, but also trying to capitalize on the hard work of those parties by playing only foreign teams. The Clippers scheduled a slate of fixtures–sponsored by the CSFA–but the USSFA acted in as obstructionist a manner as possible. The Clippers folded up shop on June 4, 1969–then promptly filed an anti-trust suit against the USSFA and NASL, alleging the USSFA required the Clippers “to secure approval for further games under procedures which it deemed unreasonable and with which it cannot comply.” The case dragged on for 18 months before settling on the proverbial courthouse steps, allegedly because the judge hearing the case advised the USSFA and NASL that they were not going to prevail. Once again, it appears US Soccer’s predecessor dodged the anti-trust bullet. Once again, US Soccer had to defend a practice that–at first blush–appears to be a naked attempt at controlling the soccer marketplace. This time, however, it had a defense. In 1978, Congress passed the Amateur Sports Act, establishing a vertical structure for Olympic sports in the United States. In its role as overseer of amateur as well as professional soccer in America, US Soccer was covered by the Act. In defense of the ChampionsWorld suit, however, US Soccer rather ingeniously claimed that the Act gave it total control over professional soccer, as well. Tellingly, the judge in the matter in preliminary motions rejected that notion as being a bridge too far. However, because ChampionsWorld had also proceeded to arbitration under FIFA procedures (and lost), as well as the specific facts of the case, the court also concluded that there were no anti-trust violations. Ultimately, the court relied upon a very technical ruling that ChampionsWorld had merely established a weak bargaining position–not that it had been effectively locked out of the soccer tournament market. The current NASL’s shot across the bow is simply the latest in a series of cases where the rather unique authority of US Soccer (and FIFA) will be tested. I will not handicap the case at such an early juncture. I will offer this opinion, however: Ramping up the D1 criteria at a time when a perceived competitor is on the horizon simply does not pass the smell test. However, the smell test does not mean much if you are permitted to haul garbage. Perhaps the Amateur Sports Act argument will be revived. Perhaps a court will decide that–based upon the existence of the NPSL–sanctioning does not preclude a league from thriving. Until then, one can only hope that a reasonable accommodation can be reached. History has shown that soccer wars do not lead to good results for U.S. soccer. A version of this article first appeared at the Philly Soccer Page on September 3, 2015. Thanks for the mention, sir. I used your research while constructing my book and I thank you for the incredible historical foundation you’ve helped build with regards to soccer’s rich history in the U.S.